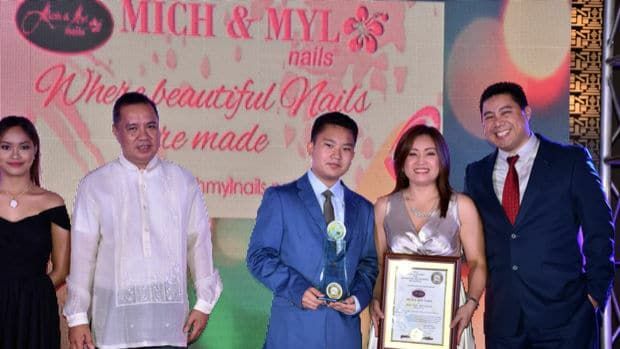 The 2017 Global Awards For Marketing and Business Excellence – Best Nail Art Salon (National Awards) was presented to Mich & Myl Nails for its excellence in product / services quality, market awareness, innovative marketing practices and value pricing. 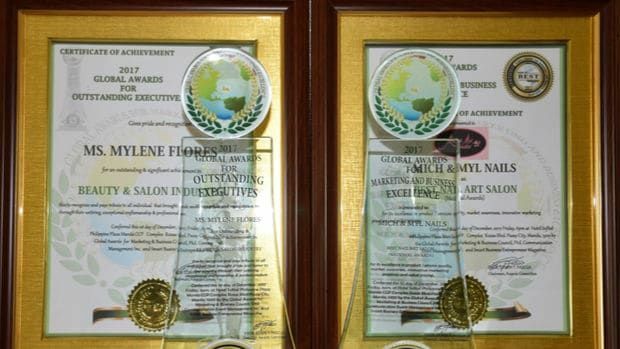 And The 2017 Global Awards For Outstanding Executives was presented to Ms. Mylene C. Flores, President / CEO of Mychael's Corporation Mich & Myl Nails for an outstanding & significant achievement in Beauty & Salon Industry, this award is to recognized and pays tribute to all individual that brought pride and honour to our country through their untiring, exceptional craftsmanship & professionalism. Conferred this 1st day of December 2017, Friday, 6:00pm at Hotel Sofitel Philippine Plaza Manila CCP Complex, Roxas Boulevard, Pasay City, Manila Philippines by the Global Awards for Marketing & Business Council, Philippine Communication Event Management Inc. and Smart Business Entrepreneur Magazine.